USA  2017  Directed by: Patrick Devaney. 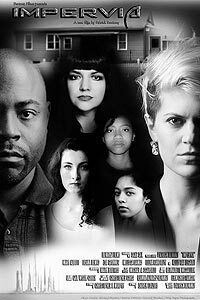  Starring: Kelly Rae LeGault, Deana Demko, Melissa Damas, Linnet J. Brooks, Marc Abbott, Elena Randolph, Zoe Gronner, Christopher J. Murphy.  Music by: Bernadette McCallion. Welcome to Impervia! With this film, Patrick Devaney, Mark Boutros and crew create a unique world that is both bleak and beautiful. Devaney has written a script that, although a work of science fiction, plays right into the anxieties of the United States in 2017. Director of Photography Boutros has taken what's in the writer's head, and on the page, and has given life to a world that is both visually exciting and ominously scary. The blend of special and practical effects help blend the worlds of science and fiction, creating something unique and exciting. The cast play their roles with intensity and humanity, especially lead Marc Abbott. Antagonist Kelly Rae LeGault steals every scene she is in, becoming one with the world she lives in. The supporting cast of Deana Demko, Elena Randolph and Zoe Gronner are perfectly cast as Abbott's family. Filmmaker Devaney has a special knack for creating these worlds and I look forward to wherever he brings us next. Review by Matthew J. Kaplan from the Internet Movie Database. Review of Director Patrick Devaney's Impervia.